Dive on the Great Barrier Reef at Lizard Island. 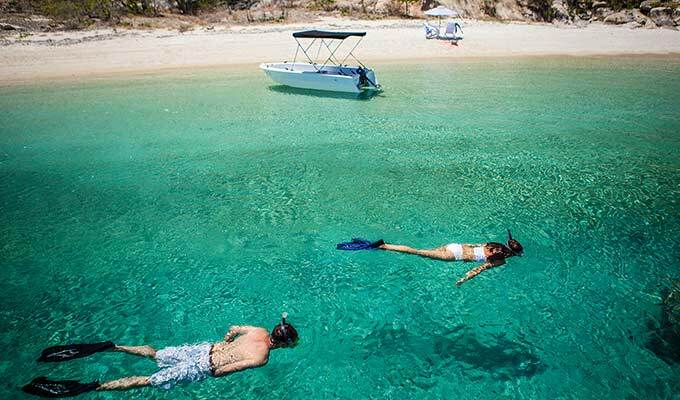 Set right on the Great Barrier Reef and boasting its own beautiful fringing reefs, Lizard Island has the advantage of being able to offer diving enthusiasts both half and full day reef experiences. Lizard's purpose-built dive boat, the MV Serranidae (the Latin name for "Grouper" - the Potato Cod is part of the Grouper family) operates half and full day excursions to stunning inner and outer reef dive sites, including the world famous Cod Hole, renowned for its huge, but friendly, Potato Cod. Naturally, the Cod Hole is subject to weather and tidal conditions. Please note: If you intend to dive at Lizard Island, please ensure you familiarise yourself with the Safety and Medical information to ensure that you are not excluded from diving. Game Fishing: The waters surrounding Lizard Island boast some of the most exciting fishing in the world. Pre-booking is desirable, particularly during the popular Black Marlin fishing season (September to December). 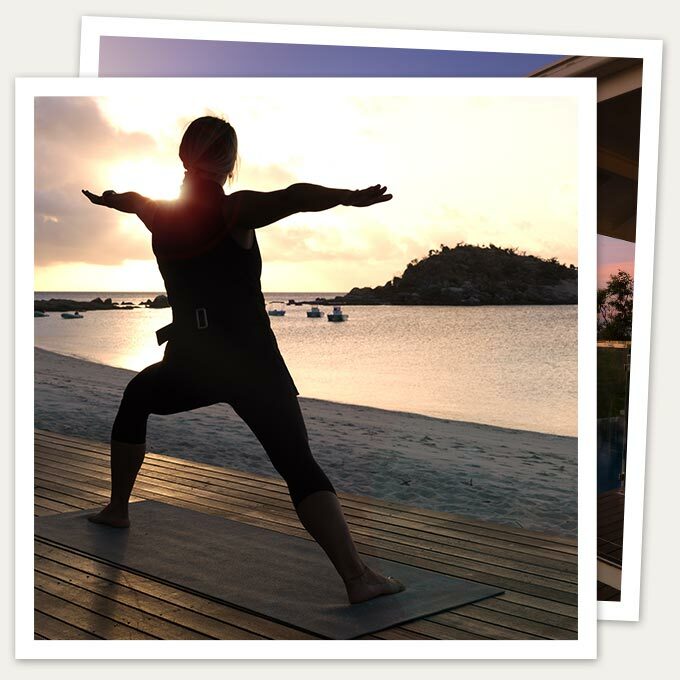 Essentia Day Spa offers a range of treatments inspired by nature to nurture the mind, body and spirit, created to enhance your health and wellbeing by embracing the powerful healing qualities of nature. Indulgent and nurturing, each signature therapy is a blend of dynamic ingredients, designed to balance the physical and emotional body. 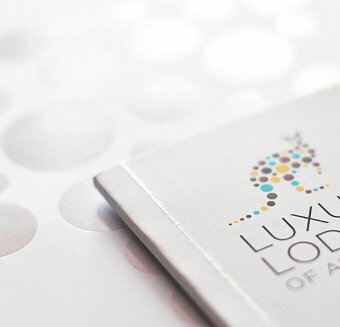 Lizard Island’s exclusive partnership with Parisian apothecary La Biosthetique represents an alignment of luxury and sensory experiences, each delivering bespoke care crafted to each individual. When choosing a combination of treatments you will emerge from Essentia Day Spa feeling relaxed and rejuvenated. 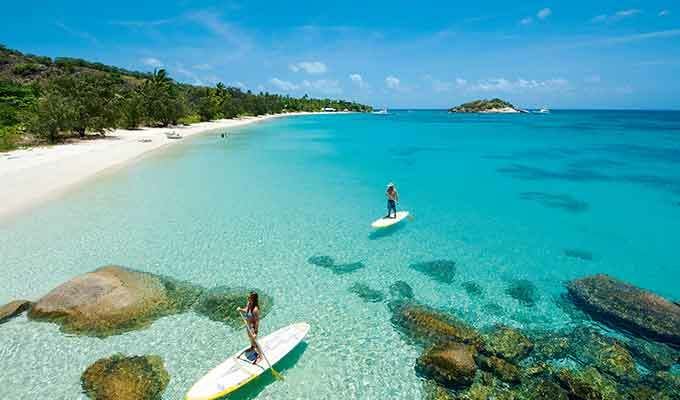 Lizard Island offers an extensive range of Great Barrier Reef activities. Please note - some activities are subject to weather and tidal conditions. View the unique Lizard Island nature calendar below so that you will be sure not to miss out on your most treasured natural wonder and unique ecotourism experience. January: The Amphibious month. Green Tree Frogs dominate the nocturnal sound show as they come out to breed. The Black Flying Fox camp sizes are at their largest, providing spectacular flight scenes at dusk around. Monitor Lizard activity is also high with tunnels being dug for nesting chambers around the island. February: Black-Naped Terns begin nesting. The Melaleuca Forests are flooded and mangrove swamps are rich with juvenile fish life. Terns swarming around Osprey Island preying on the summer fish stocks. Constellation of Orion dominates the early night sky. March: Crested Terns begin nesting. Pheasant Coucal birds changing to their darker plumage. Sacred Kingfishers often sighted around the island. April: Migratory birds such as the Lesser Golden Plover begin to show their breeding plumage before the migration to the northern latitudes. Bar Shouldered Doves nesting. Southern Cross constellation rising early in the night sky. May: Green Sea Turtles spotted feeding along the beaches at low tide. Clear skies and early twilights bring red sunsets over the Pacific. Kapok Bush begins to flower. Swallowtail Butterflies sighted around the resort. June: Humpback Whales begin their northern migration. Curious Minke Whales often approach tour vessel for a closer look. Playful Spinner Dolphins may surf the bow wave on the outer reef trips. Clear views from the top of Cooks Lookout. Centaurus shines over the meridian at night. July: Sightings of Humpback Whales during their migration to warmer waters for calving. Goannas often sighted along tracks warming their bodies in the midday sun. Osprey often sighted around their large, high nests. August: The very sociable White-breasted Wood swallows begin breeding. Umbrella trees showing off their brilliant red flowers. Constellation of Scorpio dominates the spring night sky as it chases Orion over the western horizon. September: The Marlin season begins with Giant Black Marlin cruising the outer reef during their breeding season. Minke and Humpback Whale sightings. Black Flying Foxes feed on the mango fruits around the resort at night. As the water temperatures warm towards 27°C, you’ll see an increase in wildlife activity. The prominent bright yellow flowers of the Kapok Bush in full bloom. The ‘Teapot’ in Sagittarius shines above at night. October: Lesser Golden Plovers arrive on the island from Siberia & Alaskan territories. Torres Strait Imperial Pigeon migrates down from Papua New Guinea to form breeding colonies on the island. Beach Stone Curlew patrol the beaches acting as decoys for their nests. Black Marlin begin their spawning season on the outer reef. November: Coral reef annual spawning towards the end of the month turns the blue waters orange. Kapok Trees fruiting. Green, Loggerhead and Hawksbill Turtles seen grazing on sea grasses along the beaches. Pelagic fish species active around spawning season. Monitor Lizards active whilst constructing nesting chambers. December: Occasional sightings of Manta Rays around the island. Water temperature a warm 29°C. The beaches are plentiful, 24 in all, with fine powdery white sand, undisturbed but for the occasional footprints. Coral reef gardens fringe the island shimmering in brilliant colour beneath clear turquoise water. Giant clams laze on the seabed as nosey Potato Cod keep watch. Here, the marine life is renowned the world over. Lizard Island operates the luxury vessel, 'Fascination III' exclusively from Lizard Island, providing our guests with local knowledge and experience that is second to none. Experience a Great Barrier Reef charter boat trip from your base at Lizard Island. The 51ft Riviera Platinum Model Flybridge Cruiser, 'Fascination III' has a cruise speed of 20 knots and can take up to 10 passengers (including crew). Based at Lizard Island all year round, 'Fascination III' is available for private fishing, diving and snorkelling charters. The Great Barrier reef is one of the world's must-do snorkel and dive destinations. Lizard Island is located right on the reef, with fringing reefs around the island, so it is literally s step off the beach into some extraordinary reef sites. 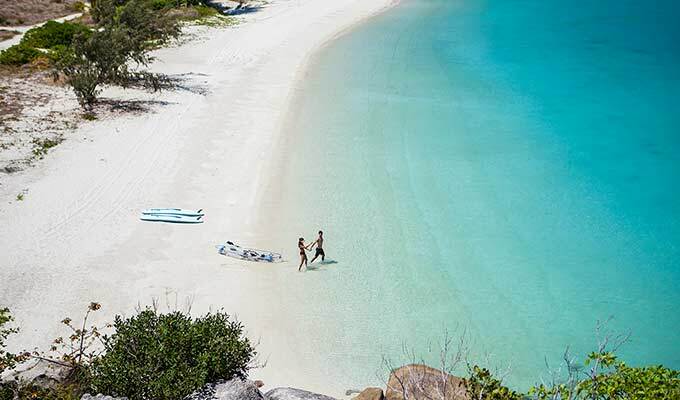 The staff at the Lizard Island Beach Club are dedicated to ensuring guests can explore the reef and the island well-equipped, safely, and have fun.